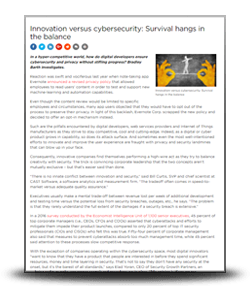 In a hyper-competitive world, how do digital developers ensure cybersecurity and privacy without stifling progress? In a 2016 survey conducted by the Economist Intelligence Unit of 1,100 senior executives, 45 percent of top corporate managers (i.e., CEOs, CFOs and COOs) asserted that cyberattacks and efforts to mitigate them impede their product launches, compared to only 20 percent of top IT security professionals (CIOs and CISOs) who felt this was true. Fifty-four percent of corporate management also said that measures to prevent cyberattacks absorb too much management time, while 45 percent said attention to these processes slow competitive response.